A railway line has shut after a vehicle crashed into level crossing barriers. The line closure has affected stations between Rowley Regis and Stourbridge Junction. 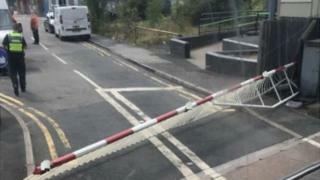 Network Rail said they were working to repair the level crossing in Cradley Heath, which was badly damaged on Friday morning. The disruption is expected to continue until the end of the day. National Rail said West Midlands Railway services may be cancelled, delayed or revised. A rail replacement service is running between Worcester and Stourbridge Junction.